On June 2, the Twins began a 4-game series in Kansas City as losers of 4 straight and 6 of their last 7. Fresh off a demoralizing sweep at the hands of the Tigers, the squad was 17-37 and buried deep in the cellar of the AL Central. The season looked lost. That night, Ben Revere - fresh off a short stint at Triple A Rochester - was in the lineup for the first time in 10 days. The Twins won 8-2 and Revere batted 7th, played right field went 1-3 with a walk and RBI double. 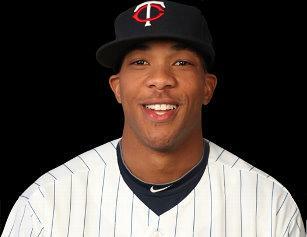 Since then the Twins are 27-12 and Revere has established himself as a major leaguer, playing in all 39 of those games. While stellar starting pitching and a hot streak by All Star Michael Cuddyer have fueled the team’s dramatic surge into contention, the diminutive outfielder’s contagious energy and enthusiasm should not be overlooked. I caught up with Revere near his locker in the Twins clubhouse prior to Friday’s game vs. the Royals. DZ: I talked to you last year - you were kinda wide eyed then - now you’ve been here a while. How different is it this year? REVERE: This year I am a lot more comfortable. Last year was a little more nerve racking - being my first time. Now, I’ve been here, I know what it’s like, I know how everybody comes to the field, prepares themselves…This year I am a lot more comfortable at the plate and a lot more comfortable in the outfield. I just go out there and have a lot more fun now. It’s fun to be out there with these guys with this run we are having right now. Hopefully we can keep this up because we are not far out from first place. DZ: How did getting the surprise call-up last year affect your confidence going into the offseason? REVERE: Big time, I had a lot of confidence. My offseason was short because I went to the Arizona Fall League, so I was a little tired. I was really, really pumped up because I knew these guys saw what I can do. I was hopeful that if I went to spring training, put a good impression on them, hopefully I could start with them, if not hopefully I’d get called back up. I just told myself “Just don’t try to do too much” - that’s what I did last year in September. That’s what kind of hurt my game a little bit, usually I am not like that. This year I have just been playing the game like I was in the minors. Luckily, everything is working out of the best right now. DZ: You mentioned trying to make the team this spring, obviously that didn’t work out - how did you overcome that disappointment? REVERE: I wasn’t really disappointed…you get to this point in baseball, you know if you start struggling a little bit, if you don’t get called up somewhere (and) you pout, pout your game suffers a little bit and they won’t call you up. Really you have to use it as motivation. You want to go up there so they won’t send you back. That’s what my dad and grandpa have been telling me, “Just go up there, play like you always play and make it so they won’t send you back.” I’ve been trying to do that so far, hopefully, they’ve been able to see that. If I do get sent back down, I am going to try my best to come back up again. If not, hey it’s been fun. DZ: I noticed you have a new number this year (No. 11, he wore No. 37 in 2010). Is there any the story behind that? DZ: Being a lead-off guy - at least right now anyway - in that role, one of your big jobs is to get on base. Drawing more walks - is that something you are trying to work on? REVERE: Oh yeah, being a lot more patient. Usually I am an aggressive type hitter. They told me, “You need to draw more walks as a lead-off guy.” I have been trying to, it’s kind of tough with some of these umpires as a rookie - you don’t get a zone like Mauer and all these big guys get (laughs). I just go out there and hopefully I can put in play. If I do get a hit that’s good and if I get on by error that’s good too - at least I know I am on base and have a chance to score. All this team wants is for me to get on base and score runs. If those two stats are up, you’ll be playing in this game for a long time. DZ: Has Denard Span helped you out with centerfield and that kind of stuff? REVERE: Yeah, he’s been helping me out since I first got drafted. He’s been like my big brother. He’s one heck of an athlete and player and a great person. He’s had me pretty much under his wing for a long time. (He’s helped) me in the leadoff role, if we are playing side-by-side he helps me out a little bit. He’s been helping me out a lot so I won’t look like an idiot in front of the coaches (laughs). DZ: Does he kid you about taking his job or anything like that? REVERE: (laughs) No, because he’s going to be there for a long time and I know I am not going to take it. I am just there to make it warm for him when he gets back. He’s going to be in there as soon as he gets back - he’s going to be the starting centerfielder and he’s always going to be there. Hopefully I can play right beside him. DZ: You were in kind of a unique spot because you had been to the big leagues, but you had never been to Triple A before this year. What was that like? REVERE: Rochester is fun. It’s cold, real cold - nice people - it was fun. My aunt lives up there in Rochester and a couple of my cousins, so they came to couple of games. It’s a nice atmosphere, everybody was rooting for the Rochester Redwings team. (There were) great coaches, they helped me keep my head on straight to help me get back here. This entry was posted on Sunday, July 17th, 2011 at 6:59 pm	and is filed under MLB, Twins. You can follow any responses to this entry through the RSS 2.0 feed. You can leave a response, or trackback from your own site.